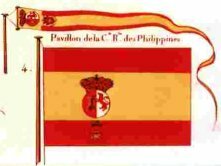 These were basically the 1785 war ensign and pennant bearing the arms of Manila city as shown for example at the International Civic Arms website but with an oval escutcheon, royally crowned on the red stripe beneath the national arms on the ensign and on the yellow stripe immediately after the national arms on the pennant. Here is a scan from Pavillons des puissances maritimes 1819 [pav19] as shown in Znamierowski 1999 [zna99]. Znamierowski 1999, p. 20 shows an 1819 flag chart [Pavillons des Puissances Maritimes en 1819] with some other Spanish ensigns like [Royal Company of the] Philippines and Pavillon Merchand Armé en Course [corsair ensign] and so on.